One of the most profound developments in the field of contemporary textiles, is a substantial shift away from the domestic sphere, and into public spaces: cafés, pubs and bars, storefronts, galleries, public transportation, the streets, and cyberspace. These public acts of making have a performative bent, transforming public spaces into shared, dynamic, communal social space. Yet textiles have always operated at the intersection of individual practice and collective, group activity. This panel explored historical and contemporary examples of collaborative, performative, and relational approaches in textiles, while connecting the social histories of textiles to todays social practices more broadly. 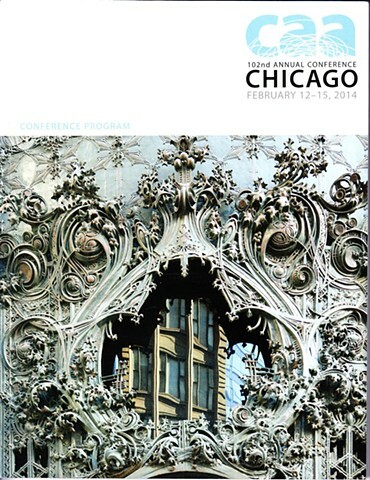 Featuring papers by Nicole Archer (San Francisco Art Institute); Nancy Feldman (School of the Art Institute of Chicago); Aram Han Sifuentes (School of the Art Institute of Chicago); Janis Jefferies (Goldsmiths); Rowland Ricketts (University of Indiana); and Julia Skelly (Concordia University). Co-chaired session with Dr. Kirsty Robertson, organized for the College Art Association Annual Conference, Chicago 2014.